"Small is beautiful" is how to describe the delicate creations of Michael Folickmann. His Jerusalem Miniatures capture the beauty and romanticism of scenes from around Israel, especially Jerusalem. His roots are in the south of France, home to many landmarks of 20th century art. Drawing inspiration from his fellow Frenchman, Marc Chagall, Michael, who now lives in Jerusalem, has the ablity to transcend the obvious, physical dimensions of life. He penetrates to the level of imagination and spirit, capturing the very soul of the subject. All of this is combined with the developed skills of an accomplished artist, whose attention to detail is the secret to the high quality of the miniatures he creates. In addition to the miniatures, Michael has also produced a set of beautifully handpainted bottles, depicting the Israeli landscape. Michael's Jerusalem Creations are on sale in many fine Judaica stores around Israel. Please feel free to view his works here on the web. 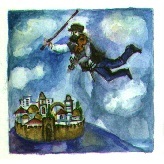 Michael Folickmann's Jerusalem Miniatures are available in original oil or watercolour, or as prints.